A diagram by James Klee from his 1982 Points of Departure. “The use of the word ‘dimension’ creates a peculiar difficulty in that it is not clearly pluralistic in nature. When we analyze we also unwillingly tend to objectify. So if a whole is analyzed into four parts one is tempted to think of ending up with four different entities. But if the analysis merely stresses four aspects we have not an objective pluralism but rather an existential pluralism. We have made the analysis and taken responsibility for the selective emphasis but the whole is not considered as disturbed. Rather we have paid attention to something less than the whole. We have restricted ourselves. The whole is not cut up into a multitude of fragments now independent of each other and of the whole” (p162). Definitions of Body, Mind and Soul from a Phenomenological Point of View, p154. I have reoriented labels and legend to better fit this format. 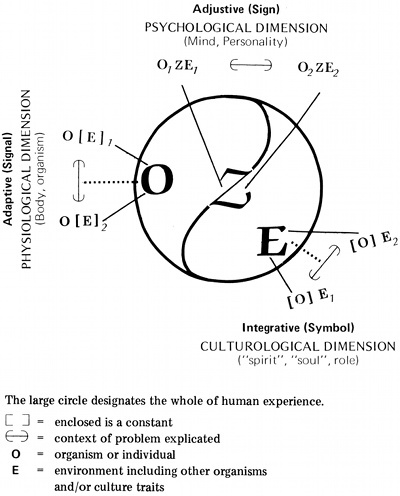 The diagram “intended to show body, mind, soul, and matter as four differend [sic] questions or contexts about the whole instead of the resynthesis of four discrete entities. The yang-yin form was to show the ever changing relationships among the various aspects. One saw the aspects in different contexts so as to selectively emphasize mind or body or soul… If it had been a motion picture it could have emphasized the temporal dimensions even more than the yang-yin does although as a static symbol it tries hard and is occasionally successful” (p162, n*). The word dimension would be pluralistic if it had an s on the end. Analysis is objectification because who is doing the analysis is always the subject. If a whole is analyzed into four parts, the conclusions to each part should be the same,in essence they should be identical, otherwise it is false analysis. Objective pluralism and existential pluralism are the same thing. All sentences should be translated so that they make clear sense to your self. What a funny diagram. Does anyone know of another website/blog similar to ‘unurthed’ –but that actually posts on a regular basis? if so, please link it.